As promised months ago, Ottawa Senators general manager Pierre Dorion made a contract offer to Erik Karlsson on Sunday. Whether it does anything to clear up the star defenceman's future remains to be seen. 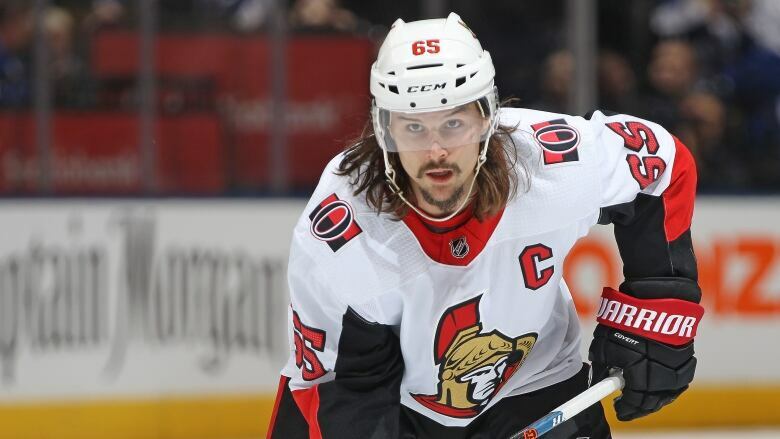 As promised months ago, Ottawa Senators general manager Pierre Dorion made a contract offer to Erik Karlsson on Sunday. Whether it does anything to clear up the star defenceman's future remains to be seen. The Senators did not swing a trade involving Karlsson as the NHL free-agency window opened, but the captain's name figures to remain in rumours as long as he does not ink an extension with Ottawa. Karlsson can become an unrestricted free agent next July. "We don't really want to talk about roster players, contract negotiations, trades, all these things, but I think we owe it to our fans and we made a promise at the town hall that we would make a contract offer to Erik Karlsson and we've done so," said Dorion. "We're not going to talk any more about it, but we talked about it previously and that's about all we're going to say on the subject." Dorion would not disclose any details about discussions with the two-time Norris trophy winner and his agent. Dorion doesn't seem to be overly concerned about getting things done quickly with Karlsson. "We start [the regular season] Oct. 4, we've got lots of time." The Los Angeles Kings signed defenceman Drew Doughty to an eight-year, $88 million US contract this weekend, which could be a negotiation point for Karlsson. Last fall, the 28-year-old said he likely would compare notes with Doughty. Dorion was vague regarding all ongoing contract discussions. Winger Mark Stone and defenceman Cody Ceci are restricted free agents, while centre Matt Duchene, like Karlsson, is entering the final year of his contract. "I don't feel it's fair to any parties to comment on contract negotiations," said Dorion. "With Stone, with Ceci, with Duchene, Karlsson, I just don't think it's fair. When you start doing that, you just tip your hand, people start reading too much into things and we didn't want that. We have a lot of respect for our players here and we're going to continue on that trend." Dorion said all the recent negative headlines about the Senators haven't affected the team in negotiations. Assistant general manager Randy Lee is facing harassment charges, Mike Hoffman was traded after Karlsson's wife, Melinda, filed a peace bond because of alleged cyberbullying from Monika Caryk, Hoffman's fiancee, and Senators owner Eugene Melnyk's ownership status remains a topic of speculation. Caryk and Hoffman have denied the allegations and the Senators have said the team is not for sale. Lee has been suspended from his role while he awaits a court date in Buffalo. "Not one, not a single one [talked about it]," said Dorion. "In our discussions with agents, and in some cases we spoke to particular players, ... everyone seems excited to come to Ottawa. In the interview period, we could talk to players and that's not something that came to our attention." Dorion did add two depth pieces on Sunday, signing centre Paul Carey and goaltender Mike McKenna to one-year, two-way contracts. The GM said discussions remain ongoing with free agents. "We know we want to have a better team next year and we know we're going to change our style of play, to a certain degree, but when it comes to discussions with free agents I don't want to go into too many details," said Dorion, whose team finished with the second-worst record in the league last season. "We don't want to tip our hand to other teams and the players that remain available." Should the Senators not be able to attract other free agents, Dorion believes there will be enough internal competition. "We will have a younger team and watching development camp there's quite a few players that have impressed us and we know they're fighting for spots in the upcoming season and one of the steps in that was when we bought out [forward] Alex Burrows," Dorion said. "We feel there's going to be a change to our roster when October comes around and it's going to be good healthy battles and we know we have a lot of good, young prospects that can take those spots. "It's not going to be a team full of young players, but if you find the right mix of good veterans that we have here and some good young prospects I think that we'll be a young, competitive, faster team next year."